I'm obviously very interested in history and wish to gorge my brain upon something well-written, delightful, interesting, and novel. I'm three weeks away from the end of school and will be more than happy to dive into something exciting following the hell of fifteen-page advanced philosophy papers. Entertain me. I'm open to many things, though American history bores me tremendously at the moment. All works of history are welcome, from Herodotus to Bill Bryson. 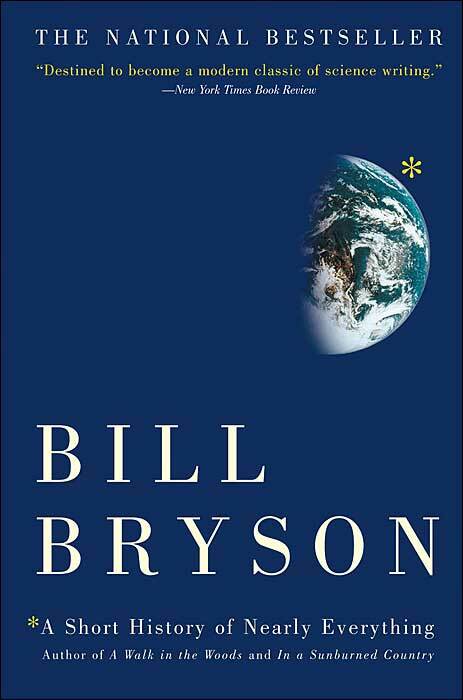 is also delightful, with Bryson's characteristic rollicking prose and wit. The anecdotes he shares on Newton and varying landmark figures in the history of science are infinitely more memorable than the groundbreaking discoveries they revealed (unfortunately). Your turn! I understand it would be much easier to consult the Guardian book review, the NYT book review, and on and on, but I have a paper to write and am happy relinquishing my procrastination to those who need it less. Highly underrated... Hard to find. Slightly old but nice. Try to get it paperback, cheap on Amazon. I borrowed this constantly from a community college ages ago, before I was old enough to take classes there and my mom had the card for the library there. I just randomly came across it. I had no idea what it was doing next to the grammar/writing books, since it's not a book how to teach you how to write on drugs. I was like "Uhh... Whuuuut?" o_o' My parents kind of made fun of me for borrowing/reading it. There was a concern but I reminded them it was about the history of them, not actually trying them. I think I was about 15 when I first borrowed this. For obvious reasons, I was obsessively fascinated with psychoactive drugs at that time. XD I was one of the few people who knew what Salvia was at the time before some US states started to pee in their pants over YT videos of idiots misusing it, thus being illegal in certain states and some more are considering it. I guess reading about these things, in great detail, helps you to stay away from them or looking at them at least, realistically. I don't think it should be a taboo topic. Drugs have their place in history. Education is important. Kids don't really relate to people who are like "OMGZ!!! !DRUGZ R BAD and im not gonna tellyouwhy!! !one!111one" They need something straightforward and realistic. The more taboo it is the more they wanna try it. Thanks! My dad's actually um, pretty heavily involved in drugs so it'll be interesting to really examine their history. The subject of drug use is fascinating. If you're still interested in it, my friend's in an addiction psychology class and I can get the reading list from him if you want! And her first name is Sadie! Reading list would be good but I barely have time for it. Life's been kind of jumpy. Gives an overview of the naval arms race between Britain and Germany in the 19th Century that exploded into WW1 at the beginning of the 20th, and the intricate imperial objectives involved. After reading it, you'll start seeing a lot of the same objectives in play in the modern era, i.e. squabbling over resources and political influence by the US, UK, the EU, PRC, etc. Last edited by Auslander; May 23rd, 2010 at 12:14 AM. The Destruction of Black Civilization by Chancellor Williams - Helps you understand how a the history of a people can be destroyed and replaced, and for what reasons. They came before Colombus written by Ivan Van Sertima - discusses the frequent trips made across the Atlantic by native Africans, and the evidence that supports it. The Motorcycle Diaries- by Che Guevarra - the movie has nothing on the book (although I did enjoy the movie).